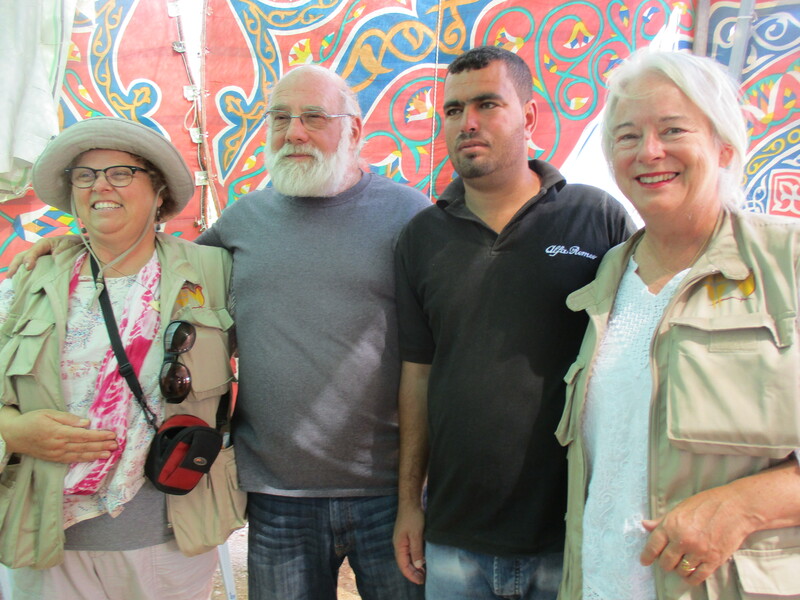 How did this small Palestinian Village of approximately 350 residents draw heads of state, the world’s media, documentary film makers, Israeli and Palestinian activists, and me. 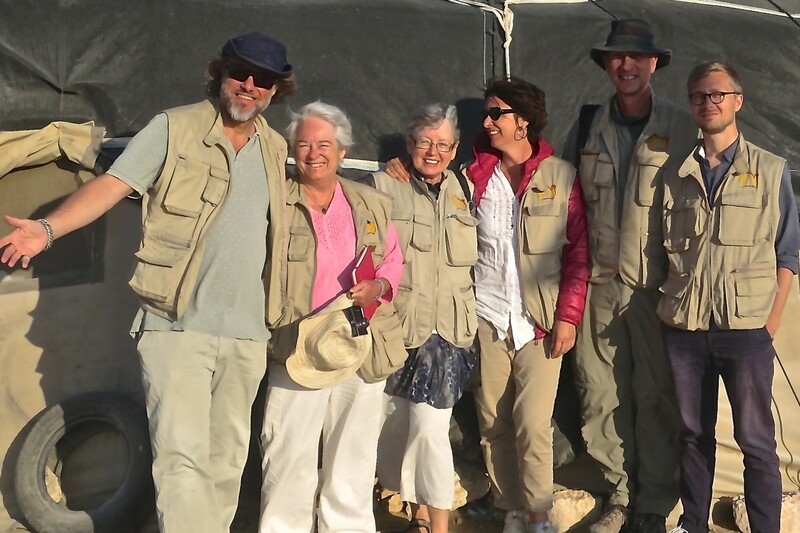 I joined 8 men and women from around the world to be Ecumenical Accompaniers in Susiya. 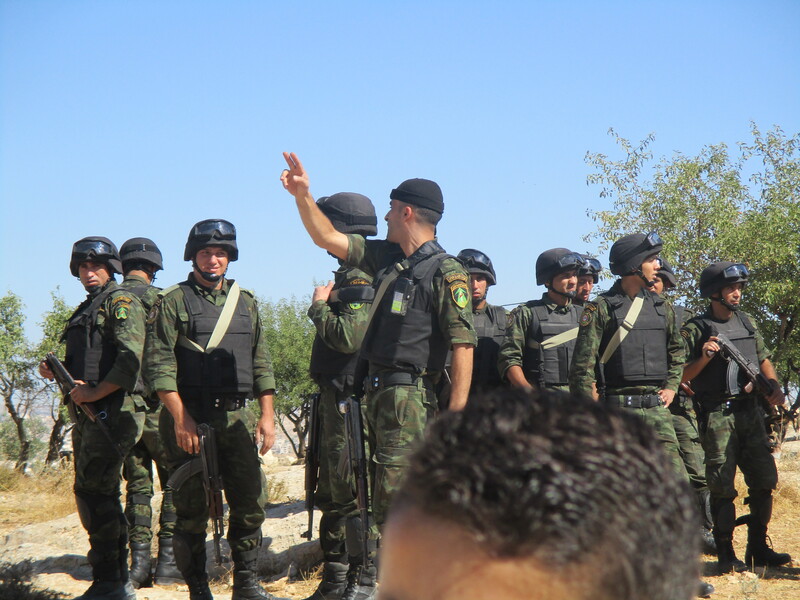 Our protective presence was requested by the UN through the World Council of Churches. 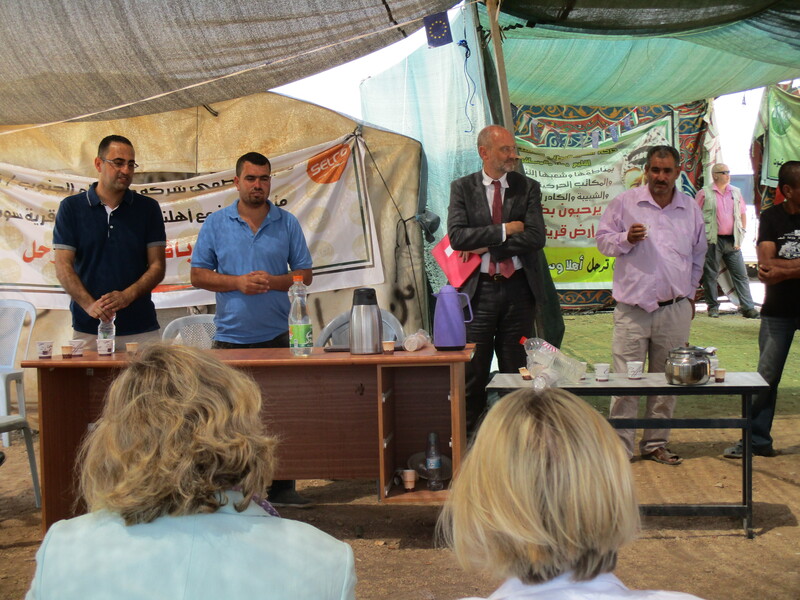 Susiya is no different from most other villages at risk in Palestine. 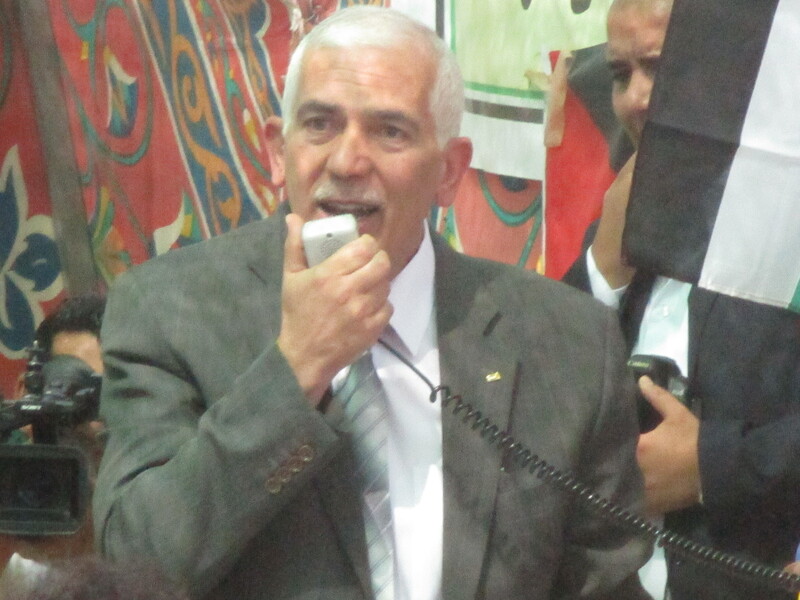 The Israeli establishment has been drafting laws for decades designed to dispossess Palestinians of their land and property. The International community has largely ignored this injustice which blatantly disregards International law and the 4th Geneva Convention. 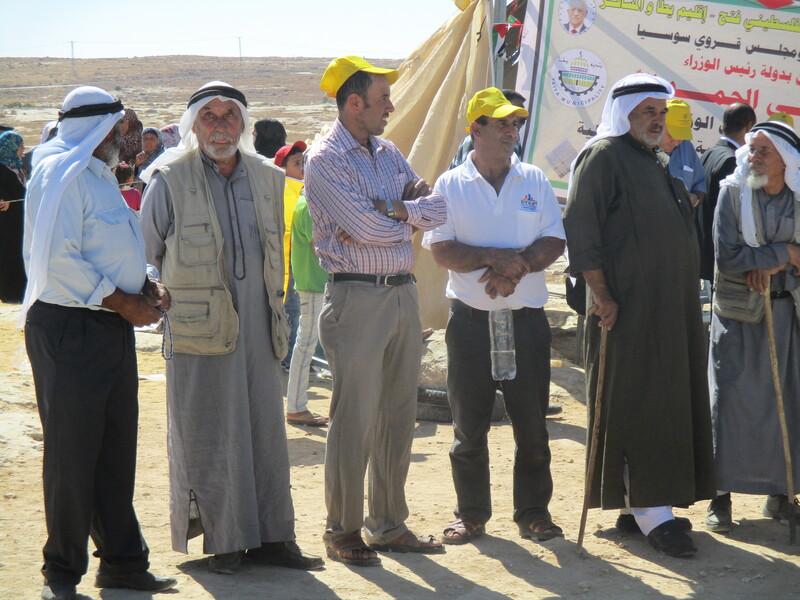 So why the sudden interest in Susiya? 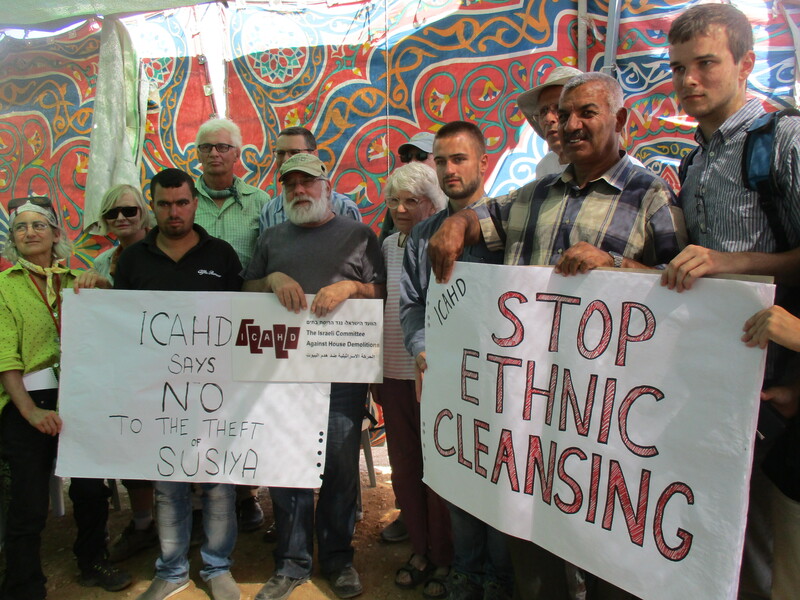 Is it because the efforts of the UN OCHA sees the demolition of Susiya, as a red line not to be crossed? Israel has been largely getting away with its wanton destruction of Palestinian lives through demolishing their homes and livelihood. Is the UN, in its reaching out to organizations opposing Israel’s disregard for the lives of the ‘Other’ saying, this is the beginning of a united concerted effort to shout a resounding ‘No’ to a continuation of this destructive policy? 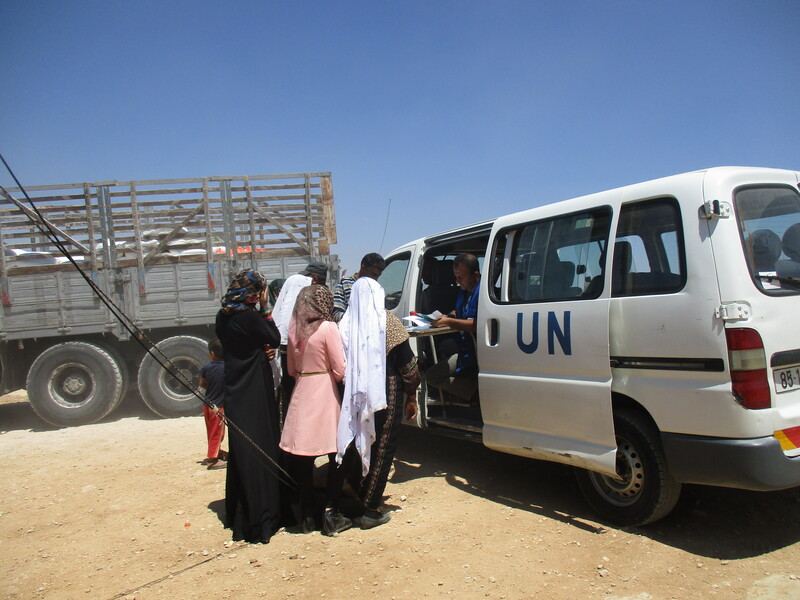 Line up for UN sponsored relief..
Why have all the consuls come. 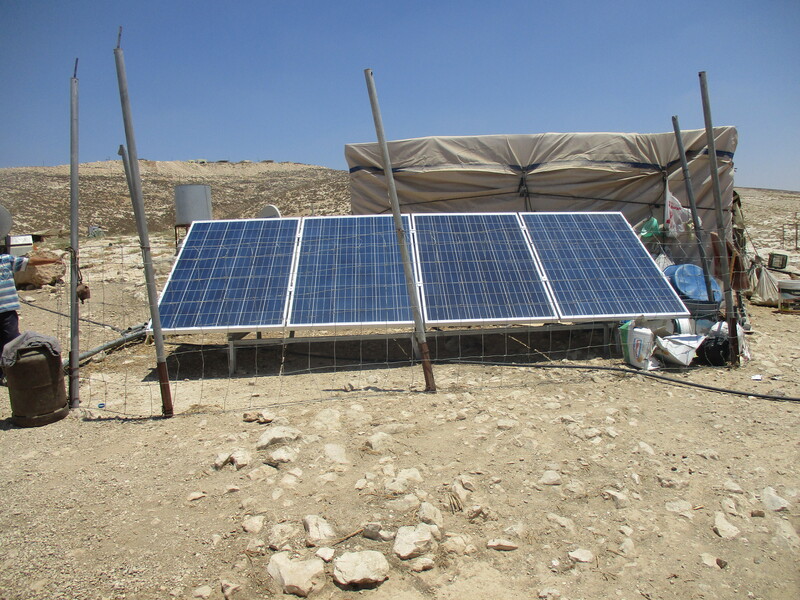 Again, nothing has changed……The various governments, the US, UK, Canada, EU, PA, have continually sponsored projects including solar panels, water cisterns, electricity, bathrooms for schools etc. 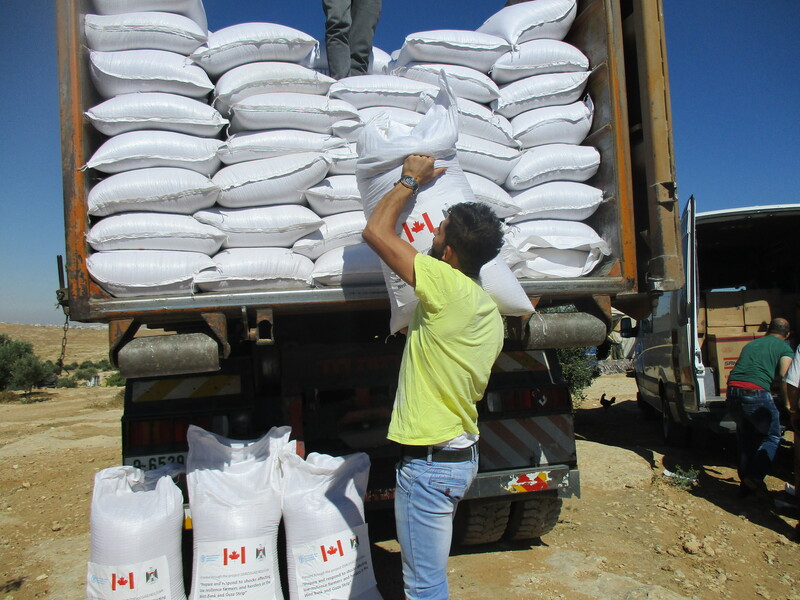 to help sustain the lives of ordinary Palestinians under occupation. 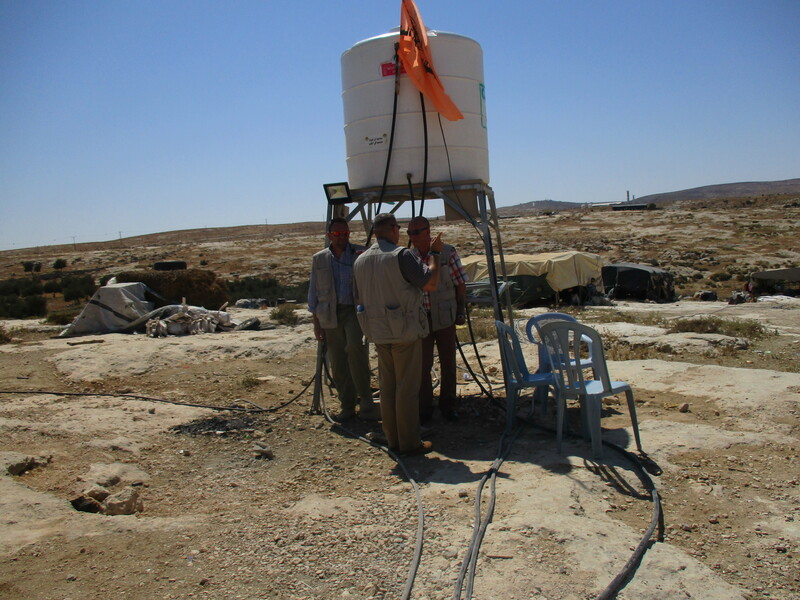 This is the way it goes – a new cistern, a demolishment order, demolishment; a new cistern, a demolishment order and so on……..Are donor countries protecting their investments, or are they getting nearer to saying ‘Israel, ENOUGH! 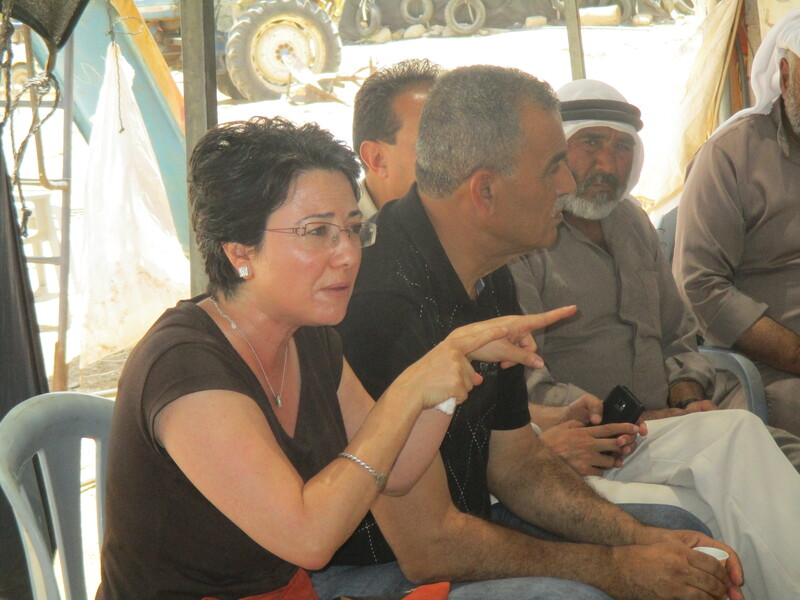 End the Occupation and begin the normalization of everyday lives of both Palestinian and Israeli citizens! Why have all the media come? 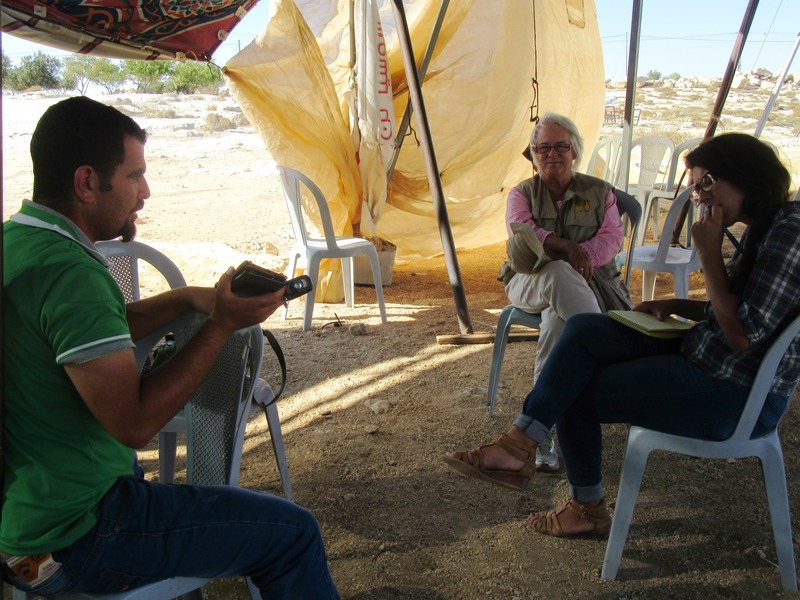 As I walk around Susiya this week, my colleagues and I are asked for interviews by The New York Times, CNN, Austrailian Broadcasting Company, Italian TV,German TV, Independent Documentary Film Makers. 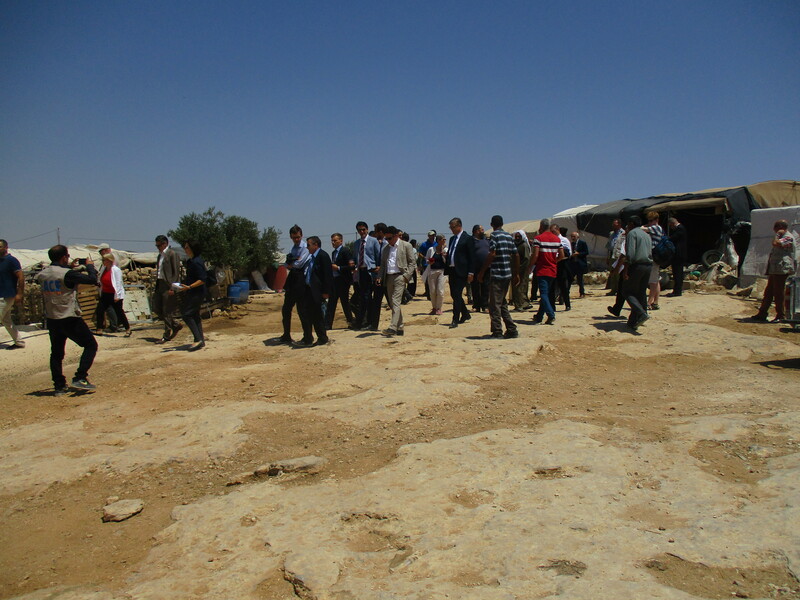 Again, nothing has changed from the month before…..
Can the reporters who tell us the stories be truly interested in Susiya? Are we finally seeing a beginning of impartiality in the telling of the story. Is it that the public, informed by social media, is tired of the misrepresentation of the facts, the lies, the bias that has been the mainstream narrative? Could it be a Kairos Moment. In rhetoric kairos is a Greek Word that means “a passing instant when an opening appears which must be driven through with force if success is to be achieved”. 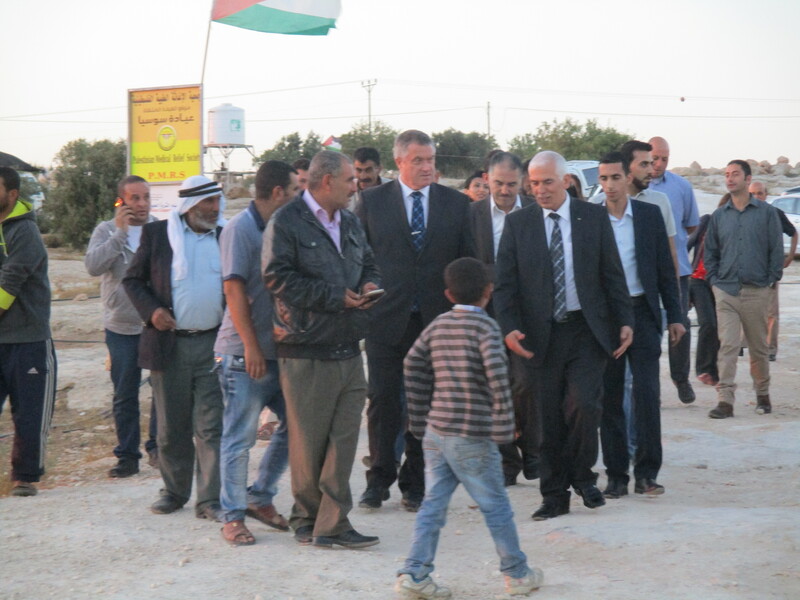 Perhaps, just perhaps, this moment in time could be that opening – we are seeing the gathering together of forces which have the power to bring about the changes which are so needed by both the Israeli and Palestinian peoples. The other face of Kairos is that if we let the moment pass, an opportunity, pregnant with possibility, is lost! And we don’t know when another opportunity will present itself. This we do know….the present situation is unsustainable. The occupation will end at some point. The process of co-existence will begin. Why not now? If the forces (you, me and others who insist on preserving Human Rights) gather and demand that International Law be upheld, the beginning of a new order can begin. We could see ‘peace in our time’ in the Holy Land! Dare we hope that ‘this is it’? Fingers, toes and eyes crossed that your collective efforts are at. Last bearing some fruit . Keep up the good work, Pat and colleagues. You are in my prayers. Daring to hope? To not have those hopes dashed as they have been dashed so often. Are we approaching a critical mass of people who see the misery that is so unnecessary?